We loved this hostel!! Booked twice in a 2 week travel period. Staff, drink prices, environment, cleanliness everything was great. Our room Boquilla is the best! Such great vibes! Hostel staff was really friendly and helpful. Great location and atmosphere. They turn the AC off in the rooms but if you need to stay in and rest, ask them and they will turn it on for you! Definitely recommend staying here. Muy lindo hostel ubicado en el centro de la ciudad amurallada. Lo único malo son los precios de las bebidas en el bar que son caros, pero como todo el resto de la ciudad en general.. música todo el día todos los días. Hermosa pileta, lugar y habitaciones. Great place to meet other people, chill by the pool and relax. The staff and volunteers were super nice, and I appreciated that they refilled my water bottle so many times from their little tap behind the bar. The breakfasts were fine (nothing special), and there was some noise that made it hard to sleep (especially on one night when the pub-crawl group came back around 3:45 am and then stayed up talking, yelling, and laughing loudly for a long time). However, overall it's a fun, friendly place. Great location in old town with a pool and decent kitchen. The roof top was closed when we were there, which was disappointing. Most of the staff was great, seems the volunteers care more about the place than paid staff. Ac in the rooms worked great, plenty of bathrooms/showers to go around. A bit expensive for what you get, but it’s Cartagena. Top bunk is bloody trechorous to get in and out of. Great to have personal light and plug next to bed. Really beautiful place, and the pool was a great way to escape the heat! The lockers I had were weird - they were all connected so when one of the ones next to me was unlocked it was pretty much pointless to lock mine. Overall good stay, well located with a lot of fun activities. Republica is really a nice hostel. I think for the price payed the breakfast should be a little bigger. The pool is nice. I didn’t like the way the dorms were made, it felt cramped with 12 people in that little space. No room for luggage’s. Friendly staff and social vibe - but honestly, it was so dirty that I ended up cutting my stay short (losing money!!) to find cleaner accommodations. It is probably on the cleaner side of other hostels in the area but stained sheets/mattresses and grungy bathrooms were enough for me to move. Only stayed one night of my four in Cartagena. Security seemed fine and location is very convenient to exploring the old city. Staff did go out of there way to move me to a bottom bunk on my first night. Im honestly very confused how this could be the highest rated hostel in Cartagena. My bed area was disgusting as there were dried up contact lenses left near my pillow. Front desk people were the rudest I’ve had my entire trip, and “add on” services like laundry are overpriced. The entire hostel is actually very overpriced. It was the most expensive I stayed in Colombia and the worst value. 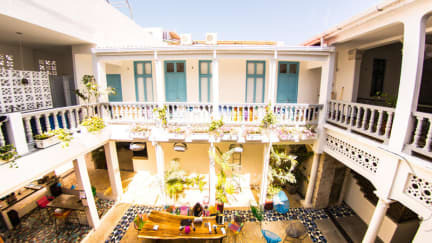 There are many other hostels in Cartagena at a better value, so I’d say avoid republica.